As we know that the KBC season 7 registration 2013 was started on 27 May 2013 to June 06 2013. KBC season 7 show will be aired by the famous Entertainment channel Sony from August end or Sep start. 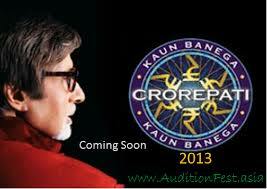 KBC is hosted by the Bollywood super star Amitabh Bachchan. As per the information the registration for the KBC special episodes "KBC School Champ" will be started from the 16th June 2013.This special episode of KBC school champ will be the part of the KBC show. All the questions for the registration of the KBC school champ will be asked by the Sony TV and www.einfoportal.com will provide you the all updated questions for this. Please note that the Age of the student must be between 14 to 16 as on May 25 , 2013. Per school only one student can register for the KBC school champ. There is only one mode of registration for this KBC school champ is available that is online mode. Online registration can be done by visiting the Sony TV official website - www.kbcsony.com . Please note that IVR/SMS mode is not available for the KBC school champ registration. As per the KBC rule the participant school name must be registered with the recognised board or central school board. Question - How many times does the earth revolve around the sun each year ? Note : Last date for the registration is 20th June 2013 till 8.30 PM. For more information, Please visit the Sony Entertainment official website.